McMillon, 47, has been Boston's Minor League Outfield & Baserunning Coordinator for the past three seasons after a six year stint as a manager in the Red Sox system…2010 & '11 with Greenville (low-A), 2012 & '13 with Salem (high-A), and 2014 & '15 with Portland (AA). Billy has actually spent the past 11 seasons in the Red Sox organization beginning with a stint as Greenville's hitting coach in 2008 & 2009. He replaces Kevin Boles, who had been manager of the PawSox from 2014-18 before leaving the organization following the 2018 season. In December, Boles was named manager of the Binghamton Rumble Ponies (the Eastern League Double-A affiliate of the New York Mets). McMillon's 12-year playing career included parts of six seasons in the major leagues as an outfielder with the Florida Marlins (1996-97), Philadelphia Phillies (1997), Detroit Tigers (2000-01), and Oakland Athletics (2001-04). He had 6 HR in 66 games for the A's in 2003 and appeared in three games during the Division Series against the Red Sox that season (won by Boston, 3 games to 2). Billy won the International League batting title in 2000 when he hit .345 for the Toledo Mud Hens (AAA-Tigers). He is presently a nominee for the IL Hall of Fame. He was an outstanding player for four different teams in the International League from 1996-2002 finishing with a career batting average of .310 with 79 HR in 609 IL games. Billy won the league batting title, IL Rookie of the Year honors, and was an All-Star when he hit .352 for Charlotte (AAA-Marlins) in 1996. After parts of three seasons with Scranton/WB (Phillies), he went to Toledo (AAA-Detroit) in 2000 and captured his second IL batting crown (.hitting .345 for the Mud Hens) while earning his second IL All-Star nod. Two years later he played his final season in the IL for Columbus (Cleveland) in 2002 where he hit .301 and was named to his third IL All-Star team. Billy made his coaching debut in 2008 as the hitting coach for the Greenville Drive (2008 & 2009) before making his managerial debut in 2010 as the Drive skipper. During that 2010 season he led Greenville to the South Atlantic League Championship series where they lost to Lakewood, 3 games to 1. Christian Vazquez was his regular catcher on that team. He was promoted to manage Salem in 2012 on a team that featured Vazquez as catcher, regulars such as SS Xander Bogaerts, 1B Travis Shaw, and CF Jackie Bradley, Jr., along with pitchers Matt Barnes and Brandon Workman who each made 20 starts apiece. In 2013, McMillon led the Salem Red Sox to the Mills Cup Championship (their first since 2001) by sweeping Myrtle Beach (2 games to 0) and Potomac (3 games to 0) in the post-season. Mookie Betts (50 games at second base), catcher Blake Swihart, reliever Robby Scott, and infielder Matthew Gedman (Rich's son) were key players on that championship club. Billy's progression continued when he moved to Double-A Portland in 2014 where he was named Eastern League Manager of the Year after guiding the Sea Dogs to a franchise-record 88 wins and the 2014 Eastern League Northern Division title. Portland was defeated in the playoff semi-finals by Binghamton, 3 games to 2. His 2014 Sea Dogs, who had the best winning pct. in all of Double-A Baseball (88-54, .620) featured Betts, Swihart, Shaw, and Scott along with starters Brian Johnson (who went 10-2 with a league-leading 1.75 ERA) and Eduardo Rodriguez following his trade from Baltimore. 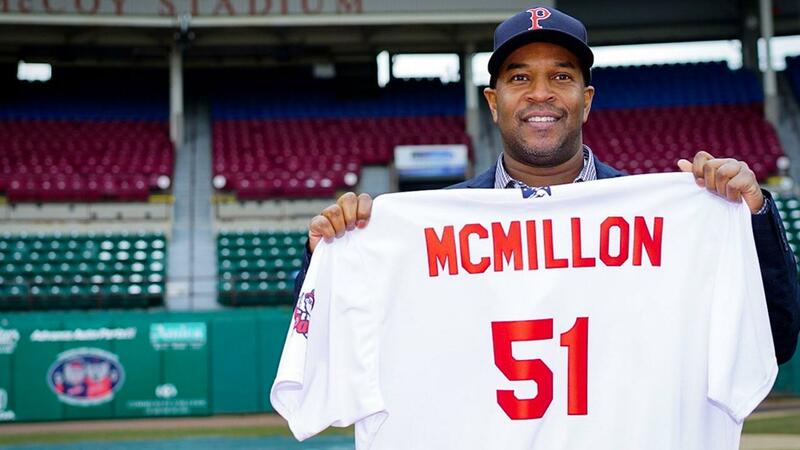 Prior to this upcoming season with the PawSox, McMillon's last year as a manager came in 2015 with the Sea Dogs on a team that included familiar names such as infielders Marco Hernandez, Tzu-Wei Lin, Mike Miller, and Jantzen Witte. Overall in his six seasons as a minor league manager, McMillon has a career record of 440-400 (.524). He has spent each of the last three seasons (2016-18) as Boston's Minor League Outfield and Baserunning Coordinator which has included stops at McCoy Stadium. Billy McMillon was born in Otero, New Mexico and resides in Columbia, South Carolina with his wife, Krista, and children, Kennedy (17) and Jackson (14). Billy earned a B.A. from Clemson University and an MBA from the University of Phoenix. During his three year career at Clemson (1991-93), he had the highest career batting average (.382) of any former Tiger. He was selected by the Marlins in the 8th round of the 1993 June draft. In 2014, Kevin Boles became the fifth PawSox manager during a six year span following Ron Johnson (2005-09), Torey Lovullo (2010), Arnie Beyeler (2011-12), and Gary DiSarcina (2013). Those four were all promoted to big league coaching staffs directly from the PawSox as Johnson became Boston's 1B coach in 2010, Lovullo was Toronto's 1B coach in 2011 and then Boston's bench coach in 2013, Beyeler was Boston's 1B coach in 2013, and DiSarcina took the Los Angeles Angels 3B coaching job in 2014. Boles won the 2014 Governors' Cup Championship with the PawSox during his first season and went on to compile 345 wins during his five year tenure in Pawtucket. Rich Gedman, also in attendance today, will return for his 5th season as PawSox hitting coach in 2019. Gedman, 59, was promoted from the Portland Sea Dogs (AA) to become hitting coach for the Pawtucket Red Sox in 2015. The PawSox improved their Team Batting average 16 points from 2015 (.238) to 2016 (.254) and continued to go up with a .258 average in 2017. The club hit .249 in 2018 led by two-time International League All-Star OF Rusney Castillo who won the IL batting title with a .319 average (becoming the first PawSox batting champ since Wade Boggs in 1981). In 2017, OF Bryce Brentz became just the 7th player in PawSox history to hit 30 or more HR in a season as his 31 homers led the International League and his 85 RBI were 4th most. Castillo again led the team with a .314 average. Jackie Bradley, Jr. and Travis Shaw had fine seasons working with Gedman in Pawtucket in 2015 and both also spent considerable time in Boston. Rich was the hitting coach in Portland in 2013 & 2014 working with such notables as Xander Bogaerts and Christian Vazquez in 2013 and with Mookie Betts (.355 in 54 games) and Blake Swihart in 2014. Portland finished the 2014 season with an 88-54 record to win the Eastern League Northern Division. A Worcester, MA native, Gedman played for Boston for 11 seasons from 1980-1990. In 906 career games with the Red Sox he hit .259 with 83 HR & 356 RBI. He is 4th in Red Sox history with 858 games caught behind only Jason Varitek, Carlton Fisk, and Sammy Walton. His best seasons came in 1985 and 1986 when he was an American League All-Star catcher both years. Hitting .295/18/80 in '85 and .258/16/65 in '86. During that 1986 season Rich caught Roger Clemens' 20-strikeout game on April 29 and played in all 14 of Boston's post-season games in 1986 as he hit .357 with a HR in the ALCS vs. California and added a homer in the World Series vs. the Mets. Gedman signed with Boston as a non-drafted free agent in 1977 and played for the PawSox in 1980 (batting .236 with 11 HR in 111 games). He also played for the PawSox for 25 games in 1981 (going 1-for-3 during The Longest Game in Baseball History in April of that year) and had a brief injury rehab assignment with Pawtucket during the 1988 season. He finished his big league career playing for Houston in 1990 and St. Louis in 1991 & '92. This is Rich's 9th year as a coach in the Red Sox system. In 2011 he was the hitting coach for the Lowell Spinners, in 2012 he served in that same role for the Salem Red Sox, and in 2013 & 2014 he was Portland's hitting coach. His coaching career actually began as bench coach for the North Shore Spirit of the Can-Am Independent League before he became manager of the Worcester Tornadoes in that same league from 2005-2010. Rich and his wife Sherry currently live in Framingham, MA and have three children: Michael, Marissa (a professional hockey player), and Matt (a former infielder in the Red Sox system who played for Salem in 2013 and 2014). The PawSox 2019 field staff will also include pitching coach Kevin Walker, who returns for his second year along with coach Bruce Crabbe, who is back for his sixth year with the PawSox. The club will have a new trainer as David Herrera, the Red Sox former Latin American Medical Coordinator, joins the PawSox replacing Eric Velazquez who was promoted to a new role in the Red Sox organization. Chris Messina will be the new PawSox strength & conditioning coach. The Pawtucket Red Sox will put 2019 single game tickets on sale for the first time on Saturday, January 26, starting at 10 a.m., at pawsox.com, by phone at (401) 724-7300, and at the McCoy Stadium Box Office. For those fans who wish to visit in person on January 26, the Box Office at McCoy will be open from 10 a.m-2 p.m. The PawSox will again hold the line on ticket prices in 2019. The lowest-priced tickets - $6 in advance for children & seniors and $9 in advance for adults - remain unchanged for the 5th year in a row. Green (Field Box) seats will again be $14 when purchased in advance, while the red seats (Reserved Box) will continue to be $13. General Admission tickets will once again cost just $9 and General Admission tickets for children (aged 12 & under) will remain only $6, as will tickets for seniors (aged 62 & over), veterans, and active duty military. The military discount is presented by TD Bank. Again this season, tickets purchased on the day of the game will cost $2 more than those purchased in advance of the day of the game. The club's full 2019 promotional calendar will be updated frequently, and fans can stay up to date at pawsox.com. The PawSox begin their 2019 season on April 4 in Syracuse with their home-opener at McCoy Stadium slated for Thursday, April 11 at 6:05 pm vs. the Syracuse Mets (and Tim Tebow). Bryce Brentz, OF - Brentz, 30, was selected by Boston in the first round (36th overall) of the 2010 June Draft and spent his first eight professional seasons (2010-17) in the Red Sox organization. The right-handed hitter was traded to the Pittsburgh Pirates on February 20, 2018, then claimed off waivers by the New York Mets on March 26. He spent most of the 2018 season with Triple-A Las Vegas, where in 55 games he hit .264 (51-for-193) with 15 home runs and a .912 OPS, batting .333 (16-for-48) with five home runs against left-handed pitchers. Brentz spent his entire 2017 season with Triple-A Pawtucket and was named an International League mid- and post-season All-Star, hitting 31 home runs with 85 RBI. In 34 career major league games-all with Boston in 2014 and 2016-the outfielder has hit .287 (25-for-87) with five doubles, one home run, and nine RBI. Colten Brewer , RHP - Brewer, 26, made his major league debut with San Diego this season, making 11 relief appearances and allowing six earned runs while striking out 10 over 9.2 innings pitched. The right-hander spent the majority of his season with Triple-A El Paso, going 3-4 with three saves, 63 strikeouts, and a 3.75 ERA (20 ER/48.0 IP) over 37 relief appearances. He allowed zero earned runs in nine of his 11 major league outings, earning his first big league win with two hitless innings on September 28 against Arizona. Originally selected by the Pirates in the fourth round of the 2011 June Draft, Brewer has made 129 career minor league appearances, including 44 starts, between the Pirates (2012-13, '15-16), Yankees (2017), and Padres (2018) organizations. Juan Centeno, C - Centeno, 29, has appeared in 111 major league games (87 starts) with the Mets (2013-14), Brewers (2015), Twins (2016), Astros (2017), and Rangers (2018), batting .227 (74-for-326) with six home runs. The left-handed hitter is 8-for-17 (.471) in six career games at Fenway Park and has batted .266 (17-for-64) against left-handed major league pitchers. He spent most of the 2018 season with Triple-A Round Rock, where he threw out 18 of 41 attempted base stealers (43.9%) and hit .234 (48-for-205) in 59 games. During the Astros' 2017 championship season, Centeno appeared in 22 games and was on the club's ALDS, ALCS, and World Series rosters, though he did not appear in a postseason game. Born in Arecibo, Puerto Rico, he was selected by the Mets in the 32nd round of the 2007 June Draft. Gorkys Hernández, OF - Hernández, 31, has spent the past three seasons in the San Francisco Giants organization, appearing exclusively with the major league club in both 2017 (128 games) and 2018 (142 games). Last season, the right-handed hitter batted .234 (97-for-414) with 15 home runs, including .277 (72-for-260) with a .778 OPS before the All-Star break. Originally signed by Detroit in 2005 at the age of 17, the Venezuelan native has appeared in 374 major league games with the Pirates (2012, '15), Marlins (2012), and Giants (2016-18), making 155 starts in center field, 58 in left field, and 14 in right field. His lone postseason experience came in the 2016 Division Series against the Cubs, when he started Game 1 in center field and appeared in two other games as a pinch hitter and defensive replacement. Oscar Hernández, C - Hernández, 25, attended 2018 Major League Spring Training camp with the Red Sox as a non-roster invitee and spent the entire season with Triple-A Pawtucket, batting .205 (31-for-151) and throwing out 17 of 39 attempted base stealers (43.6%) in 47 games. The Venezuelan native spent his first eight professional seasons in the Rays (2010-14) and Diamondbacks (2015-17) organizations, posting a 3.05 catcher's ERA in his 17 major league games (10 starts), all with Arizona from 2015-16. At the minor league level, Hernández has thrown out 41.0 percent of attempted base stealers (162 of 395). Selected by Arizona as the No. 1 overall pick in the 2014 Rule 5 Draft, Hernández was named MVP of the Venezuelan Summer League in 2011 after winning the Triple Crown with a .402 batting average, 21 home runs, and 66 RBI. Zach Putnam, RHP - Putnam, 31, missed the entire 2018 season recovering from Tommy John surgery performed in June 2017. Selected by Cleveland in the fifth round of the 2008 June Draft, the right-hander has appeared in 145 major league games-all in relief-with the Indians (2011), Rockies (2012), Cubs (2013), and White Sox (2014-17). In 130 games with the White Sox, he posted a 2.71 ERA (42 ER/139.1 IP) with 149 strikeouts, with lefties batting .228 (53-for-232) and righties hitting .210 (55-for-262) against him in that time. Putnam has pitched primarily in the later innings in his major league career, having made 61 appearances in the eighth inning and 34 in the ninth. He has faced 171 batters with runners in scoring position since the start of 2014, allowing zero home runs and holding opponents to a .196 batting average (27-for-138) in that situation. Erasmo Ramírez, RHP - Ramírez, 28, missed a majority of the 2018 season due to a pair of stints on the disabled list. He made 10 starts with the Mariners and went 2-4 with a 6.50 ERA (33 ER/45.2 IP), including 2-1 with a 3.68 ERA (12 ER/29.1 IP) in a six-start span from August 12-September 9. Originally signed by Seattle in 2007, Ramírez has appeared in 192 major league games (92 starts) with the Mariners (2012-14, '17-18) and Rays (2015-17), going 32-39 with a 4.36 ERA (309 ER/637.2 IP). In 81 relief appearances since the start of 2016, the right-hander has posted a 3.81 ERA (49 ER/115.2 IP), including a 3.23 mark (11 ER/30.2 IP) in 2017. One of only 15 players in major league history born in Nicaragua, Ramírez is 13-8 with a 3.20 ERA (80 ER/225.0 IP) against AL East clubs, having posted a 2.05 ERA (6 ER/26.1 IP) in 11 games at Fenway Park. Tony Renda, INF - Renda, 27, made his Red Sox organization debut this past season after signing with the club as a minor league free agent on April 29, 2018. He appeared in one game with Boston, 42 with Triple-A Pawtucket, and 26 with Double-A Portland, batting .318 (85-for-267) with an .826 OPS at the minor league level. His lone appearance with the major league club came on August 5 against the New York Yankees, as he entered in the 10th inning as a pinch runner and scored the winning run on an Andrew Benintendi walk-off single. His only other major league experience came with Cincinnati in 2016, when he hit .183 (11-for-60) in 32 games for the Reds. Selected by Washington in the second round of the 2012 June Draft, Renda has hit .289 (738-for-2,551) with 15 home runs in 665 career minor league games. Daniel Schlereth , LHP - Schlereth, 32, is a veteran of 11 seasons including parts of three seasons in the major leagues with Detroit from 2010-2012. He was 2-0 with a 2.89 ERA in 18 relief appearances for the Tigers in 2010 and made 49 appearances out of the Tigers' bullpen in 2011 posting a 2-2 mark with a 3.49 ERA. He has not pitched in the big leagues since 2012 with Detroit and has since been a reliever for seven different organizations - Baltimore, Pittsburgh, back to Detroit, the Cubs, Toronto, Miami, and Seattle. He finished last season with the Tacoma Rainiers (AAA-Seattle) where he went 2-2 with 1 SV and a 5.40 ERA in 12 games. An Alaska native, Daniel is the son of former NFL lineman Mark Schlereth. Carson Smith, RHP - Smith, 29, missed a majority of the 2018 season due to an injury suffered on May 14, as he was placed on the disabled list the following day with a right shoulder subluxation. On June 13, he underwent successful shoulder surgery at the Hospital for Special Surgery in New York, with Dr. David Altchek performing the procedure. Smith made Boston's 2018 Opening Day roster and appeared in 18 games with the club, 14 of which were scoreless. He posted a 3.77 ERA (6 ER/14.1 IP) and averaged 11.30 strikeouts per 9.0 innings, and did not issue a walk in his final 11 outings of the season. Originally selected by Seattle in the eighth round of the 2011 June Draft, Smith was acquired by Boston on December 7, 2015. In 29 games with the Red Sox, he has posted a 2.66 ERA (7 ER/23.2 IP) with 27 strikeouts and nine walks. Josh Smith, RHP - Smith, 31, split the 2018 season between the Mariners and Red Sox organizations, signing with Boston as a minor league free agent on May 15 after being released by Seattle. Each of his 22 appearances (11 starts) came at the Triple-A level with Tacoma and Pawtucket, as he went 5-8 with a 4.38 ERA (41 ER/84.1 IP), 90 strikeouts, and 19 walks. Smith allowed 13 earned runs in 7.1 innings over his first three outings with the PawSox, but in his final 15 games he posted a 2.84 ERA (21 ER/66.2 IP). With Pawtucket, he surrendered only one home run to the 143 right-handed hitters he faced. Selected by Cincinnati in the 21st round of the 2010 June Draft, Smith has appeared in 67 major league games (nine starts) for the Reds (2015-16) and Oakland A's (2017), going 5-8 with a 5.30 ERA (75 ER/127.1 IP) and 103 strikeouts. Domingo Tapia, RHP - Tapia, 27, made 48 appearances (four starts) in the Cincinnati Reds minor league system in 2018, including 47 for Triple-A Louisville. He went 4-5 with a 3.60 ERA (26 ER/65.0 IP), 45 strikeouts, 29 walks, and four home runs allowed. In 16 outings from July 19 through the end of the season, the right-hander allowed only two earned runs in 16.1 innings (1.10 ERA) while holding opponents to a .186 batting average (11-for-59). Against Tapia in 2018, right-handed Triple-A hitters batted .209 (29-for-139) and slugged .288. Following the season, he pitched for Gigantes del Cibao in the Dominican Winter League and made 15 appearances, 14 of which were scoreless. Between the Mets and Reds organizations, the Dominican native has made 198 appearances (101 starts) at the minor league level and posted a 4.03 ERA (277 ER/619.0 IP). Ryan Weber, RHP - Weber, 28, has appeared in 24 major league games (eight starts) with the Braves (2015-16), Mariners (2017), and Rays (2018), posting a 5.01 ERA (41 ER/73.2 IP) with only 1.59 walks per 9.0 innings. He spent most of 2018 with Triple-A Durham, going 9-6 with a 2.73 ERA (35 ER/115.1 IP) in 25 appearances (18 starts). In his seven relief outings, Weber allowed only three earned runs in 22.2 innings (1.19 ERA) while holding opponents to a .167 batting average (14-for-84). He threw at least 4.0 innings and allowed two earned runs or fewer in 14 of his 18 starts, tossing more than 5.0 innings in nine of those games. Selected by Atlanta in the 22nd round of the 2009 June Draft, the Florida native has made 100 starts and 134 relief appearances in the minor leagues, going 44-42 with 12 saves and a 3.51 ERA (306 ER/785.1 IP).